A door hanger (also spelled doorhanger or door-hanger) is a plastic or cardboard sign, generally rectangular in shape, cut to hang from the handle or knob of a door. Common uses are “Do Not Disturb” signs in hotels, parking permits (as shown at right) and advertisements distributed by hanging on the front doors of residences. We design and print door hangers on both paper and plastic. 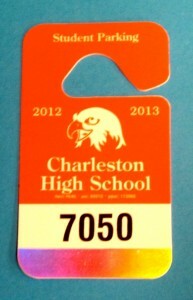 Some styles come with a side cut-out as shown in the student parking door hanger at right. Others come with a punched hole for the door knob, and a slit to allow installation. Door hangers can be printed using black ink on weather resistant card stock. When used as advertisements, they are more often printed in full color, but either way they are excellent tools to advertise your business to exactly the people you want to reach-a precisely targeted audience. Our graphic designers spend hours every day working with advertising products. We have experience knowing how much to put on a page, and where to find special font styles or images that will improve your presentation. Besides knowing how to make door hangers, we know where to distribute them. We have access to statistical information about the age and income range of people living in various Kansas City neighborhoods, and can guide you to the places your door hangers will have the most effect. Call Streamline Print & Design at 816-459-7552 in Gladstone, MO to order door hangers today.